At least 15 people were killed in or around the channel tunnel in 2015. Some were electrocuted, some run over by trains, some chased by police into traffic near the entrance. All these deaths were a direct result of people trying to get past the intensive security put in place by Eurotunnel, funded by the British and French governments, to stop them reaching England. Also in 2015 Eurotunnel, which runs the tunnel under a concession lasting until 2086, made a €100 million profit. €97 million of this was paid out as a dividend and handed straight to its shareholders, international investment firms led by major shareholder and creditor Goldman Sachs. Despite this record year, Eurotunnel is demanding millions more in compensation from the governments for “lost earnings” due to the “migrant crisis”. But just what is the Eurotunnel company, and how has it come to play a key role in the militarisation of the UK/France border? The new report on Eurotunnel by Calais Research Network profiles the company’s business and growth strategy; its owners, decision-makers, and powerful political connections; its history and crucial role in the border system at Calais; and some issues for its future development. Read it in full here. Eurotunnel has played a key role in the militarisation of the border from the start. The treaties that originally exported the UK border to France, bringing a new world of barbed wire and police patrols to Calais, emerged from negotiations around the tunnel. The governments outsource border security to the company, handing over tens of millions to fund a 300 strong private security army headed by an ex-police chief and ex-army colonel, and to install an array of surveillance and security technologies. Eurotunnel is where political, financial, and military interests come together at the heart of the Calais border system. Directors include politicians from both sides of the channel, including disgraced British ex-ministers Patricia Hewitt and Tim Yeo and local Pas de Calais heavyweight Philippe Vasseur, alongside the likes of arms industry fixer Lord Levene (chair of General Dynamics UK, and former National Armaments Advisor), and the infrastructure boss of Goldman Sachs. Nearly 3/4 of the company’s income comes from its 90+ year tunnel concession. Almost half of revenue is from the “Shuttle” train transporting cars and trucks, another quarter from access fees paid by Eurostar and freight train operators. These revenues are regarded as highly stable: so long as trade flows freely across the channel, Eurotunnel is on to a sure thing. The biggest cloud on the horizon is the great unknown of Brexit. Eurotunnel is now highly profitable, after a difficult start when it was held down by massive debts from the tunnel construction. Debt restructuring in 2007 reversed the company’s fortunes — at the expense of thousands of small shareholders who saw their holdings slashed in value. The company is now the property of international investment funds, first amongst them Goldman Sachs with 15% ownership, who extract big dividends and pay minimal tax. Eurotunnel still has outstanding debts of around €4 billion, and is currently looking to refinance these at lower interest rates. The man who pushed through the 2007 Goldman Sachs deal was Jacques Gounon, who has been at the helm since then unchallenged as both chairman and chief executive. Eurotunnel had a record year in 2015, despite terror scares and the “migration crisis”. This hasn’t stopped it announcing plans to make a €29 million claim on the governments for “revenue losses due to migrant pressure”. Back in 2009 it won a €24 settlement from the two states in a secretive ISDS court ruling about earlier costs related to border security in 1999-2002. This is on top of the undisclosed millions transferred every year by the governments for border security outsourced to Eurotunnel. 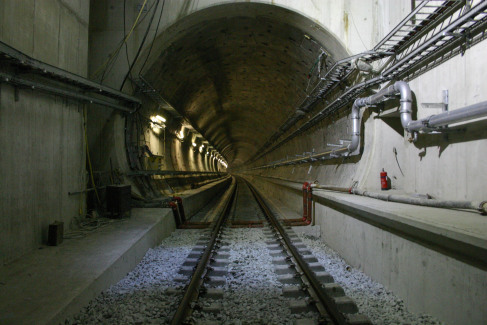 Although the company’s income from the tunnel is stable, it offers limited growth. So Eurotunnel is seeking to expand into new business areas, including expanding its own rail freight business. Other new schemes include a golf course and “eco-village” development near the French tunnel terminal at Sangatte; the Eleclink electricity grid interconnector; and participating in a failed bid for London City Airport. With a long term concession on key trans-national infrastructure, backed by two governments and one of the world’s most powerful investment banks, with powerful friends on the board and even a state-subsidised private army, Eurotunnel’s future seems assured. But nothing is for sure, and the last section of the report profiles some challenges for the company’s future. Will Brexit lead to a trade downturn? Will security problems return on the tracks and roads that lead to the tunnel? Will workers stay quiet if there are new “restructurings”? Will dependence on specialist suppliers be an issue? Can Eurotunnel keep local authorities sweet as it continues to expand its terminals and facilities? How will it fare as it moves into new riskier ventures? This entry was posted in English and tagged Eurotunnel. Bookmark the permalink.